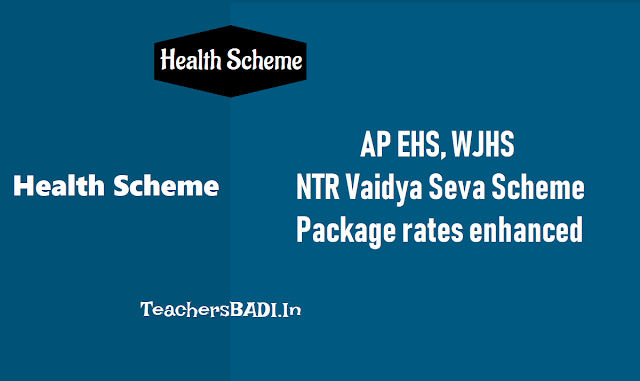 AP EHS, WJHS, NTR Vaidya Seva Scheme Package rates enhanced: Government has enhanced the package prices by 2.62% for all procedures (except Dental Category) under Employees Health Scheme (EHS) and Working Journalist Health Scheme (WJHS) for all claims raised on or after 1st September,2018 for all Private empanelled Hospitals & Government Hospitals which have complied. The enhancement has been made as per Inflation Index (of quarter ending March, 2018) as per data supply by Directorate of Economics & Statistics and the next enhancement shall be automatically due on 1st April 2019 as per Inflation Index (of quarter ending March, 2019) as may be provided by the said Directorate. The same enhancement is accorded to all procedures pertaining to NTR Vaidya Seva for the attached list of hospitals. HM&FW - Dr. NTR Vaidya Seva Trust - Enhancement of package rates under Employees Health Scheme (EHS), Working Journalist Health Scheme (WJHS) and Dr. NTR Vaidya Seva– Orders - Issued. 4. G.O.Ms.No.156, HM&FW(I.1) Dept, dt.10.09.2018. 5. From the CEO, Dr,NTRVS Trust Lr Rc.No.Dr.NTRVST/EHS/3624/CPI/2018, dated.25/09/2018. In the circumstances reported by the Chief Executive Officer, Dr.NTR Vaidya Seva Trust, AP, Guntur in the letters 3rd & 5th read above and in supersession of the orders issued in the G.O 4th read above, Government after careful examination of the matter, herby enhance the package prices by 2.62% for all procedures (except Dental Category) under Employees Health Scheme (EHS) and Working Journalist Health Scheme (WJHS) for all claims raised on or after 1st September,2018 for all Private empanelled Hospitals & Government Hospitals (Annexed to G.O) which have complied with the orders issued in the G.O 1st read above. The enhancement has been made as per Inflation Index (of quarter ending March, 2018) as per data supply by Directorate of Economics & Statistics and the next enhancement shall be automatically due on 1st April 2019 as per Inflation Index (of quarter ending March, 2019) as may be provided by the said Directorate. The same enhancement is accorded to all procedures pertaining to NTR Vaidya Seva for the attached list of hospitals. 2. The enhancement of package costs shall also be applicable provisionally for all remaining empanelled Private hospitals under Employees Health Scheme (EHS), Working Journalist Health Scheme (WJHS) and NTR Vaidya Seva from the date of compliance to the orders issued in the G.O 1st read above (annexed to the G.O.). While provisional approval is being accorded to those hospitals that have not yet taken empanelment for all specialities existing in respective hospitals, they are required to do so to ensure enhancement which shall become automatically applicable from the date of such compliance. It is again clarified that hospitals are not required to have all specialties that are covered under Dr. NTRVS Trust but are required to take empanelment for all specialties existing within respective applicant hospitals and not selectively for certain specialties. 3. Any discrepancy with hospital wise specialty empanelment can be brought to the notice of the CEO, Dr. NTR Vaidya Seva Trust by respective hospitals before October 15th 2018. 4. The Chief Executive Officer, Dr. NTR Vaidya Seva Trust, A.P., Guntur shall take necessary action accordingly.